Dr. Jongerius holds master's and doctoral degrees in mathematics, but she enjoys other languages as well. In fact, she combined her undergraduate math major with a major in English and a minor in German. Dr. Jongerius has published papers in algebraic geometry/commutative ring theory. 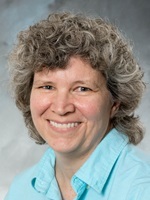 Sabbatical research led to "Rules and Insights: Connecting the Mathematical and Linguistic Abilities of C.S. Lewis," which combined math and literature, her two greatest academic loves. She also worked with a team of writers from the ACMS (Association of Christians in the Mathematical Sciences) on a book called Mathematics Through the Eyes of Faith, published in the summer of 2011 by HarperOne. Jongerius co-authored three of the chapters: "Infinity," "Dimension," and "Proof and Truth." Her most recent publication is "Pressure and Impulse in Student Learning: What I Learned From Teaching Physics." Mathematics Through the Eyes of Faith, co-author of chapters "Infinity," "Dimension," and "Proof and Truth," 2011. "Rules and Insights: Connecting the Mathematical and Linguistic Abilities of C.S. Lewis," Journal of the Association of Christians in the Mathematical Sciences, 2009. "Etale Cohomology of Toric Varieties Defined by Infinite Fans," with Frank DeMeyer, Journal of Pure and Applied Algebra, 1996. "Examples of Reflexive Modules," with Frank DeMeyer, Methods in Module Theory, 1992.